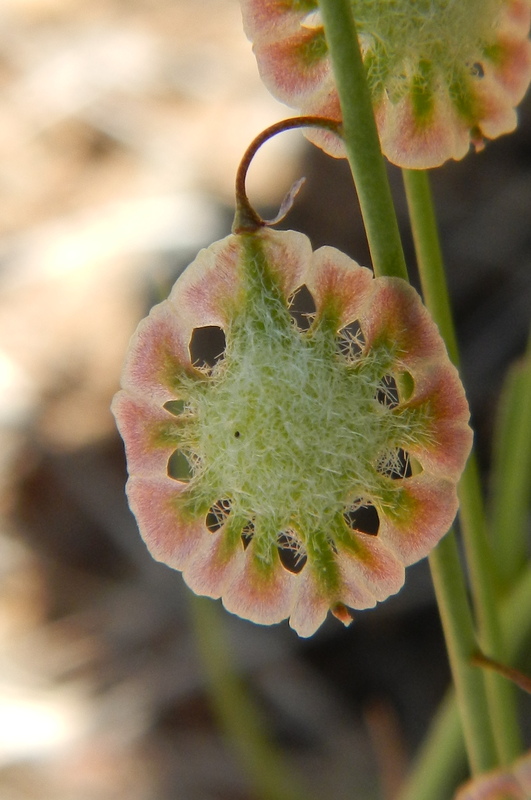 This small plant has somewhat unremarkable flowers, but fruits that are quite striking. In early spring, fringepod plants have a raceme of tiny, white, 4-petalled flowers that are easily missed. In fruit, however, this plant produces delicate, lacy, fruits that are about a quarter inch wide. Each contains a single seed within. The scientific name is derived from the Greek for “fringed” (thysanos) + “fruit” (karpos). Fruits of plants in the mustard family are described as siliques, which have two fused carpels and are in general much longer than they are broad. In genera such as Thysanocarpus and Lepidium, however, when fruits are as broad as they are long, the fruits are referred to as silicles. Fringepod has a broad distribution across the California Floristic Province.